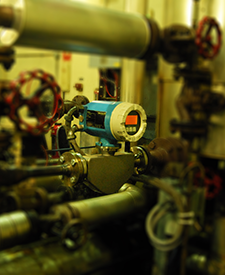 Northwest Electrical Services designed, supplied, and installed a fuel flow measurement system for an international client wishing to replace outdated mechanical fuel flow meters with a networked solution to interface with existing plant systems. Northwest Electrical services designed and installed both mechanical, instrumentation, electrical and communication systems for multiple generating units communicating over Ethernet using TCP/IP using Endress + Hauser instrumentation and Allen-Bradley Endress + Hauser communication integration to a Allen-Bradley CLX PLC(s). The system required replacement of existing installations and piping modifications in other areas to allow for accurate measurement of both inlet flow and recirculation flow resulting in an accurate real time measurement of fuel consumption on an individual unit basis, and ability to totalize all flows for overall plant consumption. All data is transferred into Allen Bradley ControlLogix PLCs utilizing the Rockwell Automation and Endress + Hauser integration utilities. Additionally data is integrated into the Plant Historian database, Wonderware Plant Historian. This installation has allowed the client to perform accurate routine performance testing, online monitoring of engine utilization and performance, and real time analysis of overall plant fuel consumption between monthly tank soundings. The system was commissioned and placed in service Q4 2011.